Kent got tired of dealing with this little nut so he came up with his own special tool. It is a wide blade screwdriver with a special ground tip to get in and easily loosen and tighten the nut. Loosening this nut will allow you to adjust how well the glove box door closes. Tool also works on the same slotted nuts on the W126 chassis cars from 1981 to 1991. You have to push down on the door to get the screw driver straight onto the nut. You can also use this same tool to pry out the pin plugs that hold the glove box in place. these can be a pain to get out and this tool will prevent deforming the pin. This tool is now being made in our shop and available for purchase. It comes with a rubber protective tip to prevent damage to the narrow tangs and to prevent poking your hand! Be sure to check out Kent's little kit for repairing the latch assembly inside the 123 glove box door. See related products. 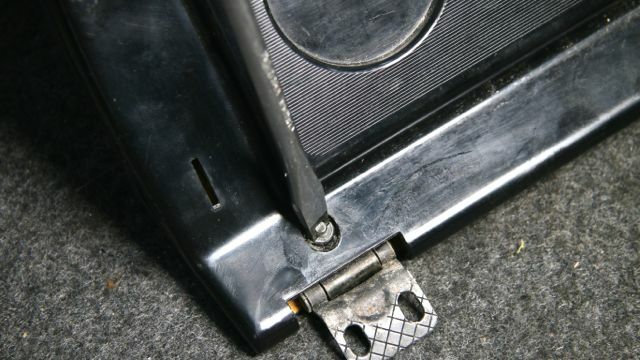 How Do I Find the Problem on My Glove Box Door? Hardest part is removing that weird round slotted nut on the lower hinges!